He defends the Taliban, hangs out with Yasser Arafat, and urges a violent, armed struggle by Arab terrorists. Yet Adam Shapiro, formerly of Brooklyn, New York, is the American media’s latest media darling. Shapiro, who was born to a Jewish family and grew up in the United States, is portrayed as an idealistic, nice guy who–like every Miss America candidate and Rodney King–wants us to all just get along. He supposedly demonstrated this by staying the night with buddy Yasser at the Arafat Terrorist Bed and Breakfast in Ramallah, recently. With his shaved head, bandanna-scarf babushka, and hoop earring, he’s a hip dude, too. But the real Adam Shapiro makes these comments laughable, and his ample writings in the defense of terrorism and even the Taliban make these respected news operations seem like incompetent nitwit newsgatherers, at best. Like his new slumber party pal Arafat, his real feelings, as expressed in the Arab media, put the lie to what he says in the Western media. On April 1st, Shapiro claimed on New York’s WOR radio station, “I want peace, an end to all violence.” But Shapiro–and the press’ pandering coverage of him–is the April Fools Day prank that keeps on giving. A little research and fact-checking by lazy reporters covering this American supporter of terrorism against Americans, Jews, and Israelis, would show that Adam Shapiro is hardly a peace activist of any kind. Critics have compared Shapiro to American Taliban terrorist, John Walker Lindh, a claim his family insists is unwarranted. It’s no coincidence that the “Guerrilla News Network,” last week, picked Shapiro as its “Guerrilla of the Week,” last week. Ironically, Shapiro’s previous claim to fame was as a counselor at Seeds of Peace, a camp in Maine for Arab and Jewish youth that emphasizes tolerance. That’s why the camp is a joke. Like his brother’s and future sister-in-law’s comments, you can’t believe anything Shapiro’s family says. His parents claim they had to suddenly leave their Brooklyn apartment due to death threats. But not before they spent time posing lovingly for and interviewing with the New York Times. It’s hard to feel sympathetic for them, though, when their son is associated with Hamas and Hezbollah tactics aimed at killing of Jews and Americans. After all, Adam’s parents are Jews and Americans. The Shapiro family cast their garbage upon the waters, and it has revisited them. The fact that they were born of Jewish blood may be a novelty to the media. But it is really just an accident of birth. That their son is a terrorist for Yasser Arafat and defends the Taliban is a matter of choice and improper parenting. 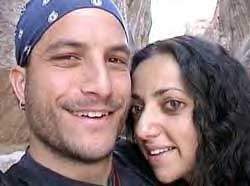 Shapiro says he will return to the U.S. in May for his wedding to Arraf. But not until he gets a security detail. Given his rhetoric and terrorist friends, it’s America that needs security from Adam Shapiro. Love your good investigative talent. Keep up the good work!